The northwestern part of Vietnam is one of the most interesting and beautiful areas of Southeast Asia. Vietnam is home to 54 ethnic groups and the northwestern part of the country is an exciting place to see the lives, customs and cultures of some of Vietnam’s ethnic minorities. With majestic mountains, the gentle and romantic villages, magic terraced fields as well as the radiant smile, all make a fascinating Northwestern area. North West of Vietnam Tour via the less traveled route is an off-the-beaten track adventure to north-western Vietnam for 5 days, 4 nights. Experience an interesting trekking tour on bumpy roads. Enjoy tasty cuisines in the northern Vietnam. Admire the breathtaking mountain viewa and majestic terraced rice fields. Experience village local homestay with the warmth of ethnic people. This is a valley of Văn Chấn town, Yên Bái city. 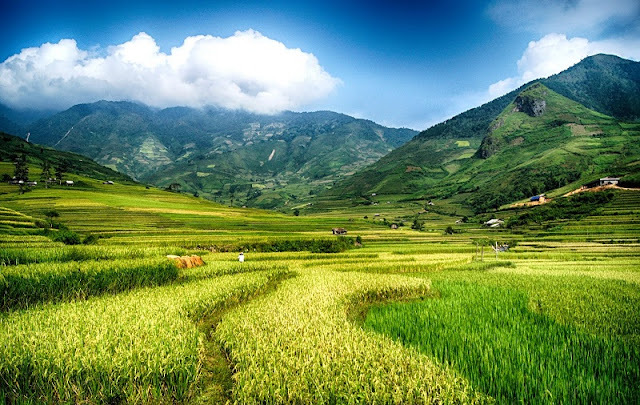 Regarded as one of the most favorable destinations by tourists, Tú Lệ Village attracts people by its natural beauty with delightful crop fields. Moreover, when coming here, you can experience the fresh hot spring and even happen to catch the sight of Thái people taking shower by the springs, which is one of their traditional customs. Nghia Lo, with a population of 30,000, is tucked away in a big, flat valley called Muong Lo and offers many experiences for tourists. It is second only to the Muong Thanh valley of Dien Bien Province in terms of size and is surrounded by unlimited chains of mountains. In this region, at this altitude (approximately 1000 meters) the rice is ripe between the end of September and the beginning of October: some fields have been harvested and have the brown color of dry land while others are yet to be harvested and show a beautiful bright yellow color. 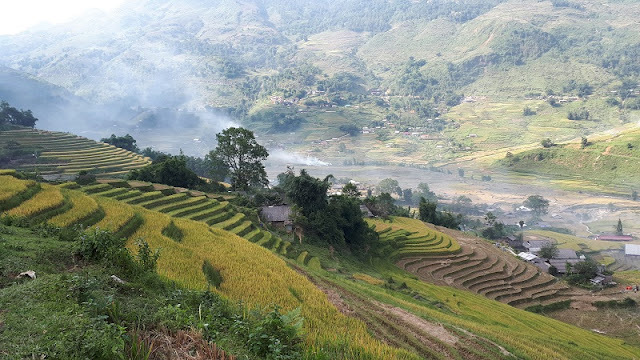 In this region of Vietnam, the ripening of the rice happens 2-3 weeks after those in Sapa (the most popular place in Vietnam where most tourists go to see terraced rice fields). Mu Cang Chai is a renowned district of Yen Bai, winning praise for the creative and heavenly terraced rice field. The destination is nestled at the bottom of Hoang Lien Son Mountain Range and is 1000m above sea level. To reach Mu Cang Chai, tourists go through Khau Pha Pass – one of the four leading passes in Northwest Vietnam. The journey to Mu Cang Chai is full of imposing landscapes. The terraced rice fields in Che Cu Nha, La Pan Tan, and Ze Xu Phinh in Mu Cang Chai has been recognized as national landscapes. This creatively gorgeous terraced paddy field is evidence that human hands can create a masterpiece in harmony with nature, making Mu Cang Chai an outstanding attraction in Vietnam. The two best months for Mu Cang Chai photo tour sare September and October. You will continue to trek to Ta Van village, which is the village of Zay minority. You will admire the plenty of stunning landscapes. Moreover, you have a chance to get the rich cultural heritage of them through many songs. You can see women who wear a five-paneled vest, the trousers and a turban around the head. In contrast, Zay men are more simple, for example, they wear the trousers, short vests with a turban around their heads. Giang Ta Chai village is the home of the Red Dzao minority. During the trekking route, you will admire the majestic terraces, the silver waterfall, and suspension Rattan Bridge. It is a chance to meet the local people, interact with them and share the cultural experiences with their families. Red Dao women usually wear a long blouse over trousers, distinctive red triangular shaped turban. The men typically wear a short shirt with long trousers, and a headscarf. Both men and women have a square piece of fabric on the back of their shirts which represents that they are children of God. The interesting experience here is the memorable memories in each person's life when coming to Northern Vietnam tours. If you are interested in this tour, click here.